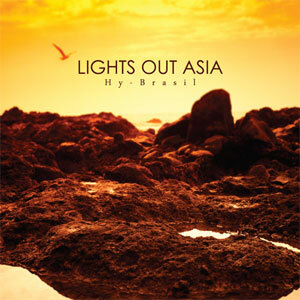 Hy-Brasil is also the title of Lights Out Asia’s latest album, their fifth since 2003 and their fourth for Californian imprint n5MD. Until recently, Lights Out Asia operated as a trio, formed of Chris Schafer (guitar, vocals), Mike Rush (guitar) and Mike Ystad (electronics), their sound, a blend of dreamy guitars and ethereal synths, likening them to the electronically-fueled shoegazers of the last decade. With Rush’s departure following the trio’s last album, In The Days Of Jupiter two years ago, LOA have slightly shifted the sonic balance between the two of them to give the electronic side of the project a stronger presence. Stripped of part of its hazy guitar textures, the band’s sound has become smoother and dreamier. Alternating between lush instrumentals and nebulous vocal tracks, a process which they have applied on previous records, Hy-Brasil is a pretty chilled affair, served by rich soundscapes dipped in incredibly vast reverbs. Listening to LOA, it is impossible not to think of the cinematic feel of Robin Guthrie’s production work, but the resolutely electronic tone of this record and its sweeping melodies also evoke the likes of Brian Eno or Vangelis. Although not a concept album as such, a simple reading of the track titles (The Eye Of All Storms, An Imperfect System, Birds Sing Sun-Rising Hymns, O’ Ancient World, Arise!, They Disappear Into The Palms…) seems to indicate a narrative running through the whole record. Yet, this never comes close to overshadowing the music which, from one end of the record to the other, flows beautifully. Schafer and Ystad create stunning melodic pieces which are then wrapped in warm and rich sonic layers and guided by heavy electronic percussions. The guitars are more discreet than on previous records, but still regularly erupt in hazy saturated clouds (The Eye Of All Storms, Only What You Take With You, Angels Without Hands). Elsewhere, they sometimes resonate through most of a track, their rich jangly motifs adding to the softly ethereal tone of the record. The voice remains partly buried under layers of sounds and reverbs, not to the point of becoming inaudible, but enough to occasionally rendering the lyrics slightly mysterious. The departure of Mike Rush has given the two remaining member of Lights Out Asia the opportunity to review their template slightly, develop a refined, reconfigured version of the band and deliver a rather beautiful sweeping soundtrack.